Chromogenix Factor Xa. 71 nkat, is for the determination of Heparin in plasma. 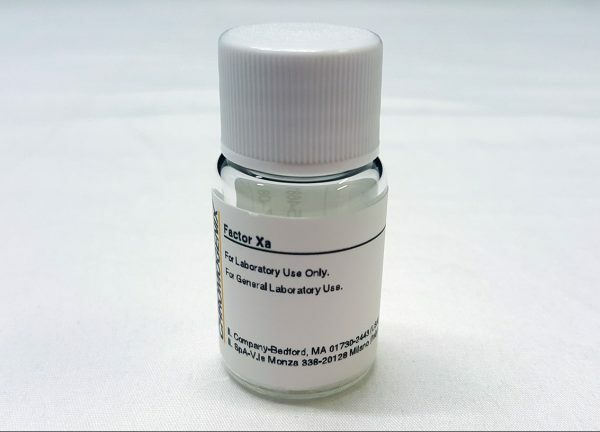 Factor X is purified from a barium cytrate elution of bovine plasma and it is activated to FXa by a Russell’s Viper Venom matrix. The lyophilized powder is stable at 2-8°C until the expiry date printed on the label. The reconstituted Factor Xa is stable for 1 month at 2-8°C or 6 months at -20°C when used for the determination of Heparin, according to the test conditions of the Chromogenix® Coatest® Heparin kit, catalog # K255539 (25553963). Reconstitute with 10 ml sterile water to obtain an activity of 7 nkat/ml (reaction buffer: 0.05 mol/l Tris buffer pH 8.4). Chromogenix Factor Xa can be used for anti-FXa chromogenic assays.